Premiership football is back and it has been another busy summer of spending by the 20 clubs involved. Whilst much is made of the levels of debt at the clubs, what about the levels of debt for the people in the areas represented? Debt Free Direct have worked out the average debt per person per area, based on their customers. The North East and Newcastle and Sunderland in particular, are the areas that have the highest average debt per person per area. Interestingly though, these same areas also had the highest average income, thus creating a correlation between spend and levels of debt. 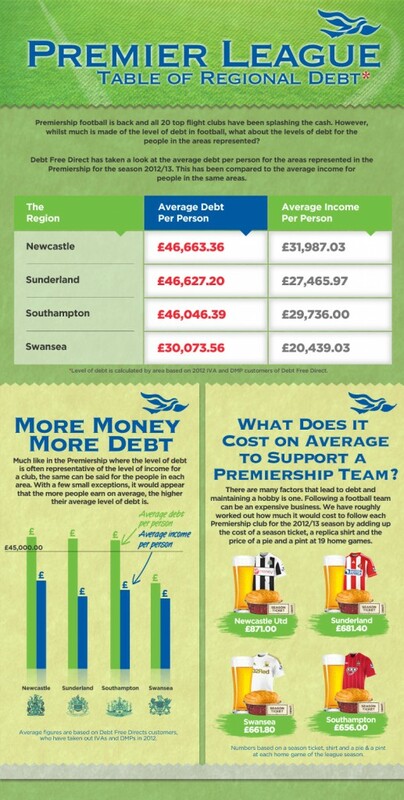 However, whilst there are many factors that affect debt, (including hobbies like following a football team) in this case there wasn’t a direct connection as both Newcastle and Sunderland faired rather well in the table of how much it costs to follow a Premiership team for the 2012/13 season. Wow!!!! That is shocking in one way – and totally logical in another. People are always commenting on how I can live on “practically nothing” – but that “Practically nothing” is all relative isn’t it?? Compared to London – it is a flat rental – compared to Thailand its a couple of months high living!! It would seem that the local environment / peer pressure may have a little input here too – I know when I lived in the City the pressure to spend more was greater. BTW – I am in Bloomsbury for MADS award at end of the month – can I buy you and the Mrs Savvy a “wedding Toast”? [email protected] recently posted..Just gonnae “Stop Spending”!! It seems that no matter where you live, people seem to feel the need to have more things (debt) with higher incomes. It would be nice if higher incomes meant higher savings instead.